Born in Milan on December 6, 1962. 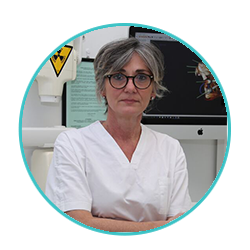 She obtained the Diploma of Specialization in Dentistry and Dental Prosthetics at the University of Pisa (July 1, 1994), with a score of 50/50. Master in Endodontics at the School of Operative Dentistry of Padua (1990), Periodontology I and II at the Santa Chiara Clinic in Milan (1995). In 1997, she attended the advanced course in Clinical Endodontics held by Prof. Rosenberg, owner of the Department of Endodontics at the New York University College of Dentistry.